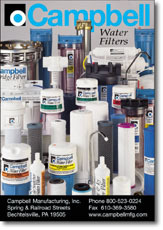 Campbell Manufacturing Inc., of Bechtelsville, Pa., has announced the recent NSF International certification of many of its water filter housings and cartridges. The company manufactures a broad line of quality water system accessories and filtration products. The certification demonstrates the company’s continuing dedication to the water industry.